Well well well, after watching on and off for years, the Today Show has proven to be useful for something after all. While guzzling my beloved cup of coffee the other day, they had an interesting segment on freshening up your interior decorating, which perked my ears right up. 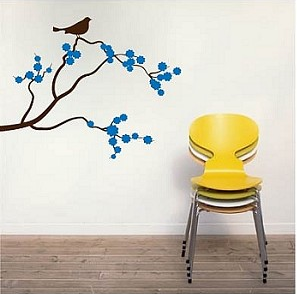 Especially when they suggested using wall decals to add a little color or pizazz to a boring solid color paint job. I have never had a head board, but the pictures in Crate & Barrel catalogs would have me believe everyone has one and that I should buy one for $799 stat. 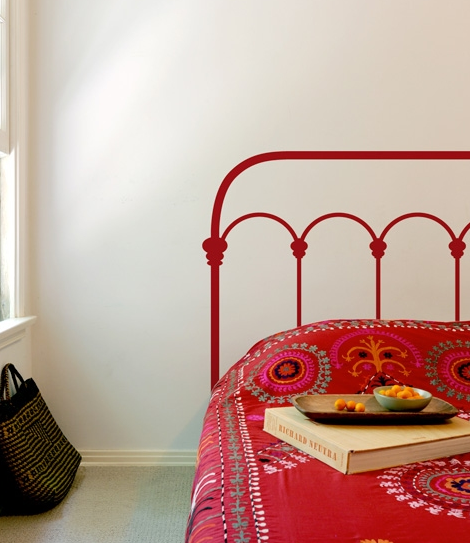 Instead, these decals can give a nice illusion that you can afford a real grown up bed and not just the bare bones mattress and bedspring. Plus, for around $60, you can easily change them out if you get bored... That's so much nicer than the moving guys grumbling at you as they realize there is yet another piece of furniture that you forgot to mention in your quote and they are going to have to hoof it down the 4 flights of steps.